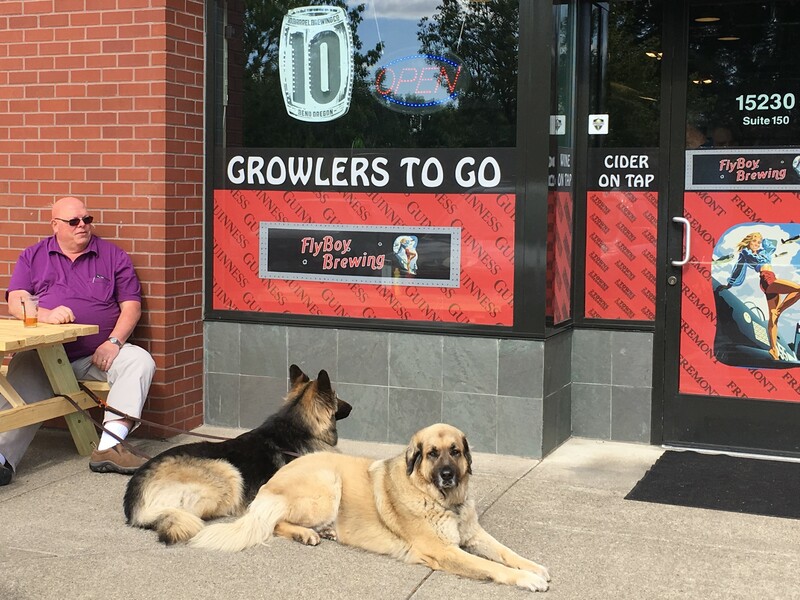 Mark Becker, the founder and owner of Flyboy Brewing and Michelle Faubion, his Operations Manager, are wonderful people and typical of those one meets in the Oregon microbrew business. 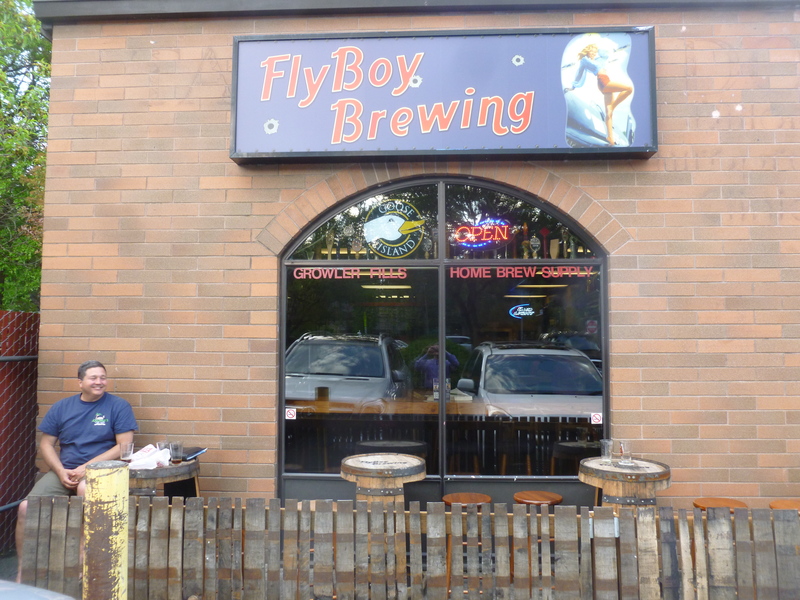 Flyboy Brewing’s “takeoff” is another one of the entrepreneurial successes. 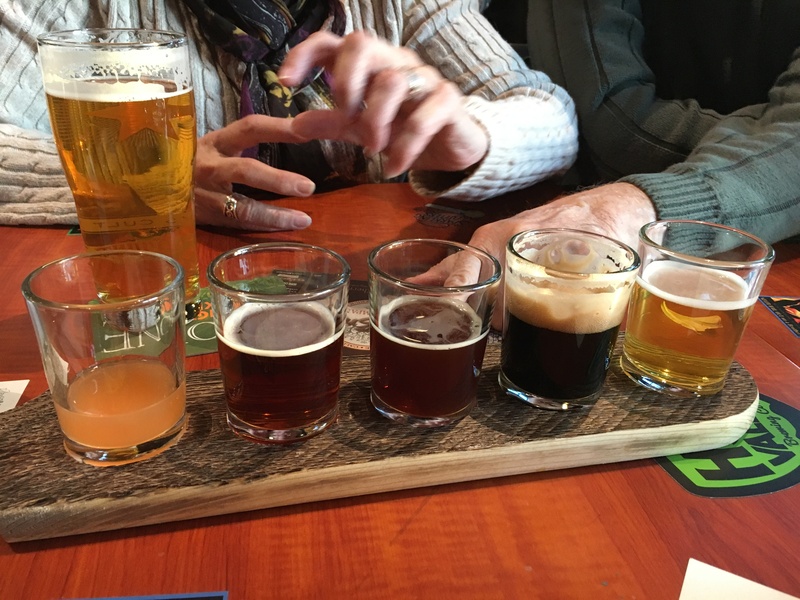 Thebeerchaser blog has chronicled the path of similar microbreweries in Oregon including Caldera in Ashland, Ancestry in Tualatin, Sasquatch in SW Portland and Wolf Tree on the Oregon coast to name just a few. All have helped to make the $4.49 billion direct and indirect contribution to the Oregon economy according to Oregon Brewers’ Guild. And like a number of other venues featured in past posts, one may not be captivated when viewing the enterprise from the outside. 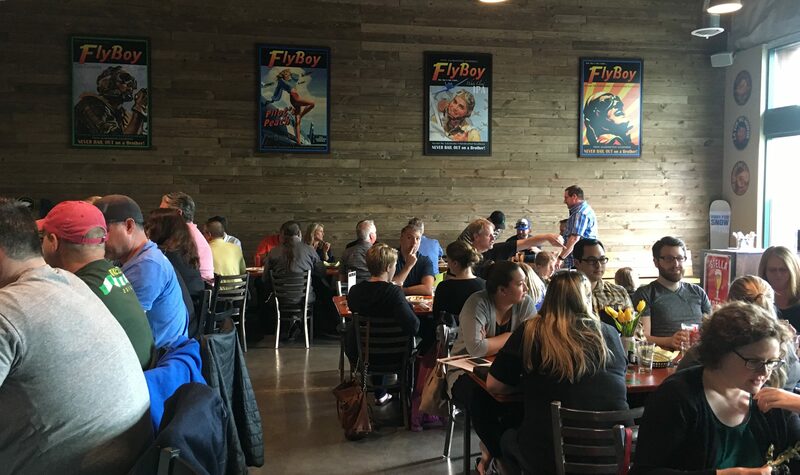 But stepping into Flyboy (at least as evidenced by my six visits to the new brewpub in Tigard), one is hit with the vitality and energy which emanate from patrons, staff and even from the beer itself! Flyboy is a dream of Becker, whose story is below. 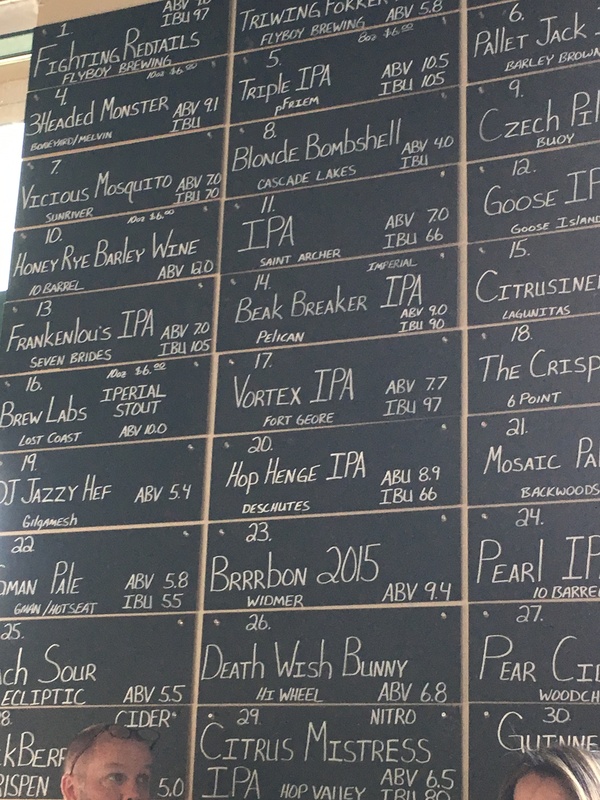 Thirty beers and ciders on tap from a diverse group of breweries…. Among those we tried were SunRiver Brewing’s Vicious Mosquito and Vermont Vacation, Light Me Up Lager by Springfield’s Hop Valley Brewery and Three Headed Hop Monster (a collaboration by Boneyard, Melvin and Barley Brown Breweries – a very limited release which went fast…), one of my old standby favorites – Vortex from Astoria’s Fort George plus all of Flyboy brews and a beer with a kicker, Breakside’s Safe Word Triple IPA with an ABV of 11.1%! And a good way to enjoy a number of the beers and not have to rely on Uber for a ride home, is their Beer Flights – five for $10. You might want to include the Wizard of Koz in that group, which Michelle recommended – blueberry, chocolate, vanilla aged in a bourbon barrel – new from Founder’s Brewing in Michigan – a venue Michelle discovered when she was in medical sales after nursing school at the University of Washington. Happy-hour is 3 to 6 PM each weekday and all day Sunday. 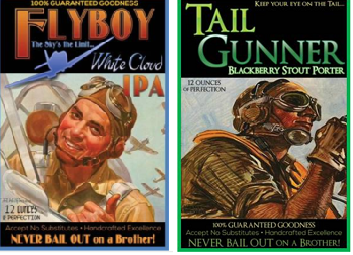 That means Flyboy brews are only $4 per pint, $1 off wine and good appetizers ranging from $5 to $8. This ones going to win some awards! Well it took awhile – like twenty years in the automotive industry at Leif’s, Les Schwab and Beaverton Honda and then tile work. He and his wife had been prudent and after working in the corporate world, wanted to be their own bosses. 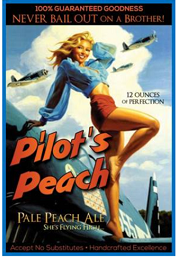 The name of the brewery is a tribute to his grandfather, a B-29 pilot in World War II and who also trained pilots in P-51’s. His other grandfather from the Great Generation helped build the battleship, USS Missouri. 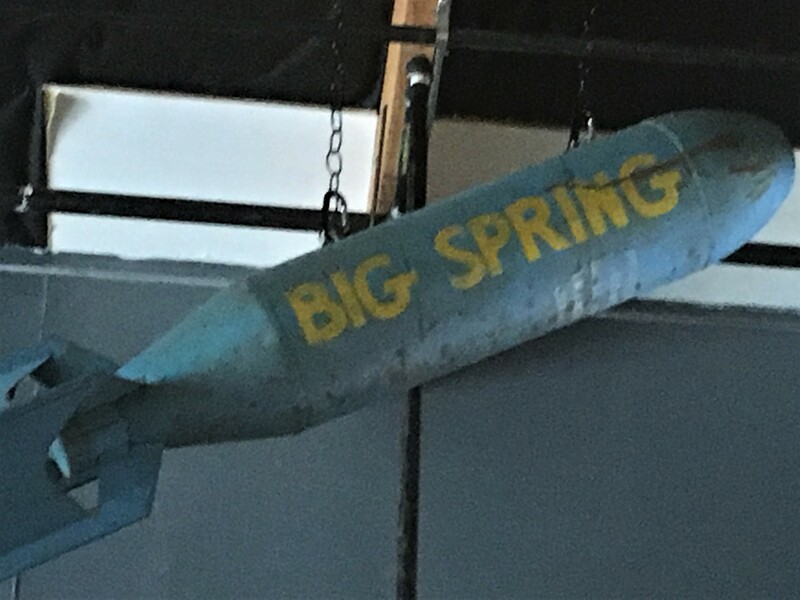 The flag and the dummy bomb (from training exercises at the Big Spring Army Air Corps Base in Texas) were his grandfather’s and complement the art and the other aviation memorabilia. 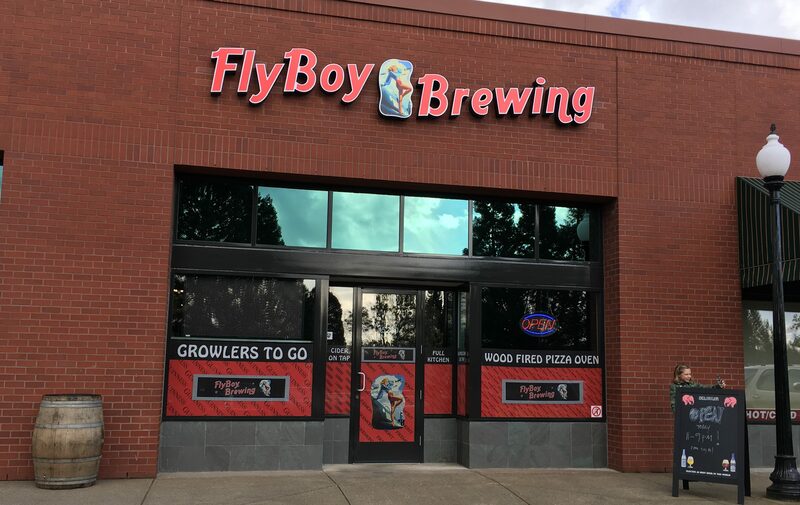 Mark’s research determined that the name “Flyboy” was available and after securing the legal rights, he wrote to the American Aviation Historical Society for permission to use their artwork – it was in the public domain and they sent out templates for him to convert into signs and interior art which are a highlight of the pub in Tigard. 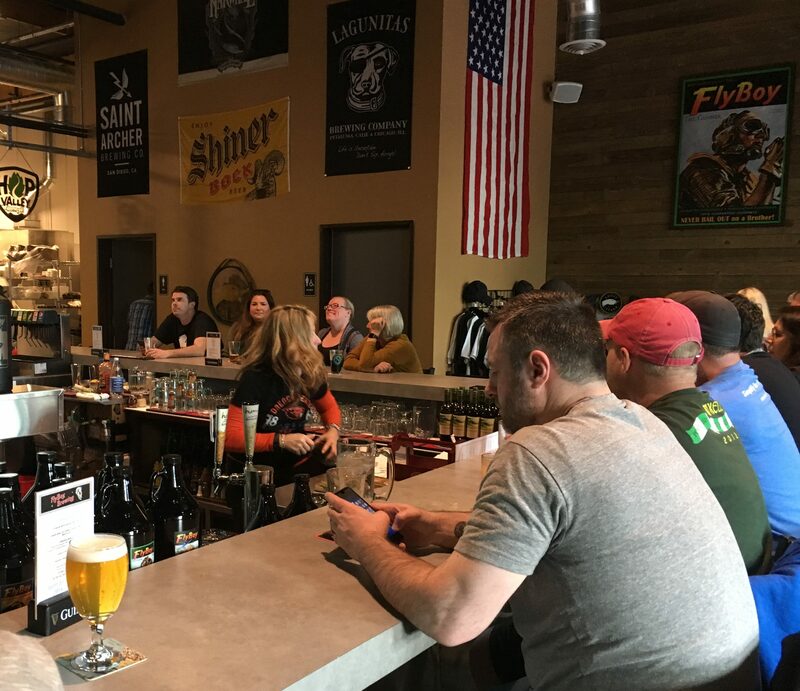 As is often the case with start-up breweries, the active and passive resistance of bureaucrats can discourage or even crush the plans of entrepreneurs. 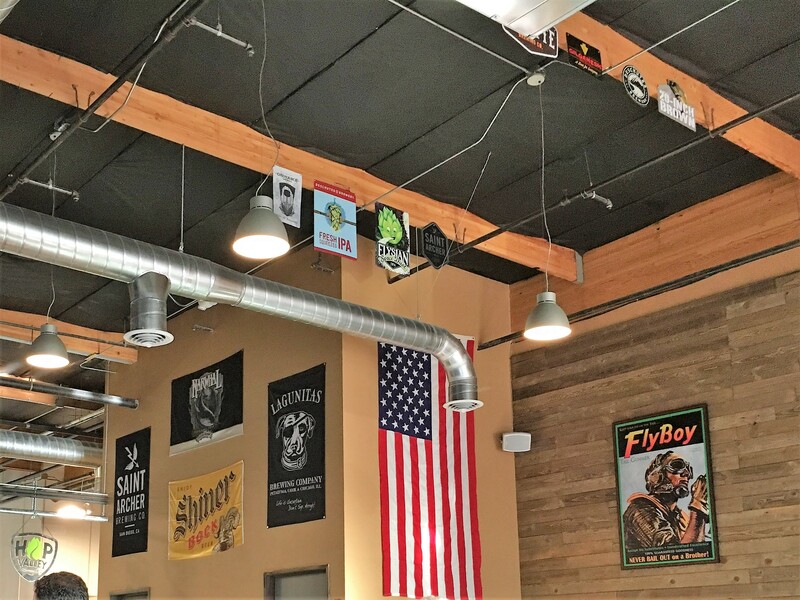 Mark persisted after his plan to expand in 2014, and which initially looked promising as a venue in a hangar at the Aurora Airport, was batted down by the FAA and Marion County. Then while going to the Tigard Home Depot, he saw vacant space and contrary to his prior experience, PAC Trust Realty and the City of Tigard were “awesome” in the manner they responded and expedited the lease and permits to start their Sequoia Parkway location. 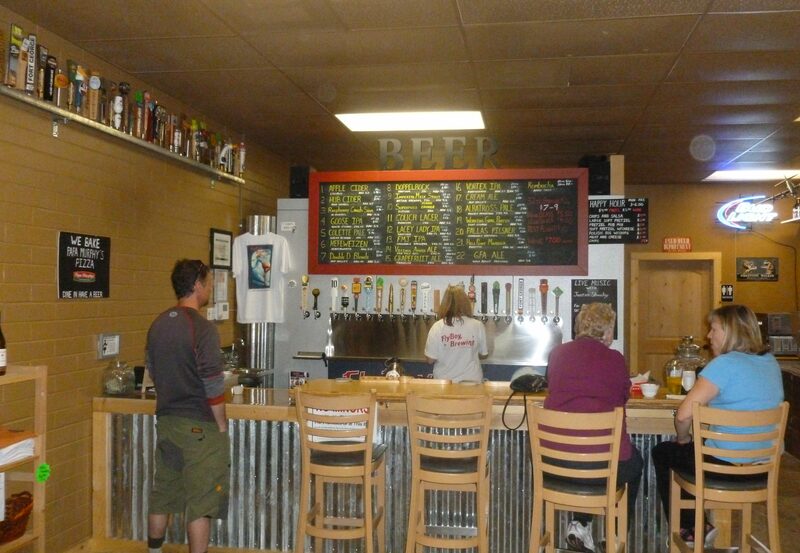 The grand opening at Tigard was April 17th – three years to the day of the original location in Lake Grove. 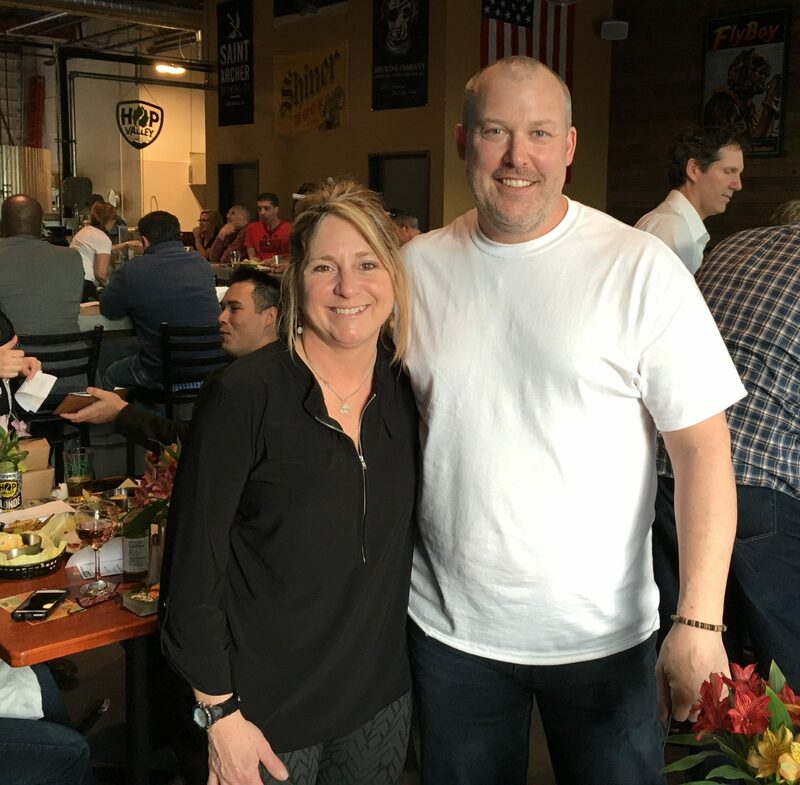 Mark originally met Michelle Faubion at a beer conference, and as is the case with most people, remembered her. She accepted his offer to become his Operations Manager. Michelle is a remarkable woman and besides having an impressive background, is one of the most charismatic people I have met in the five and one-half years of Thebeerchaser. 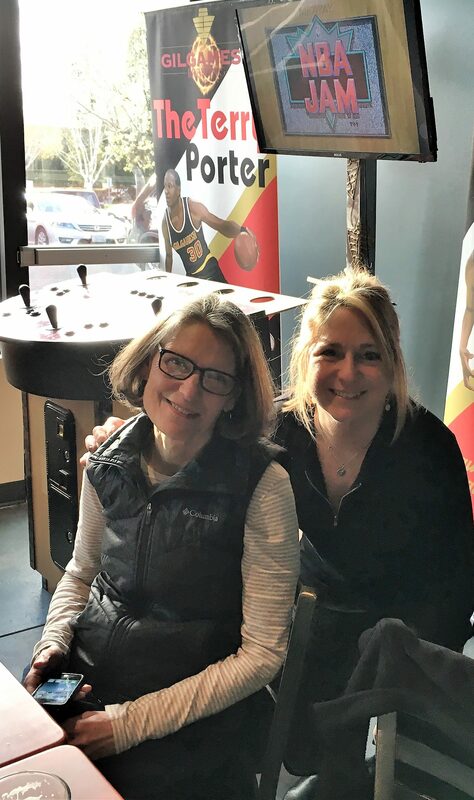 She was originally featured in this blog as the co-owner of the Hop N Cork in Lake Oswego. 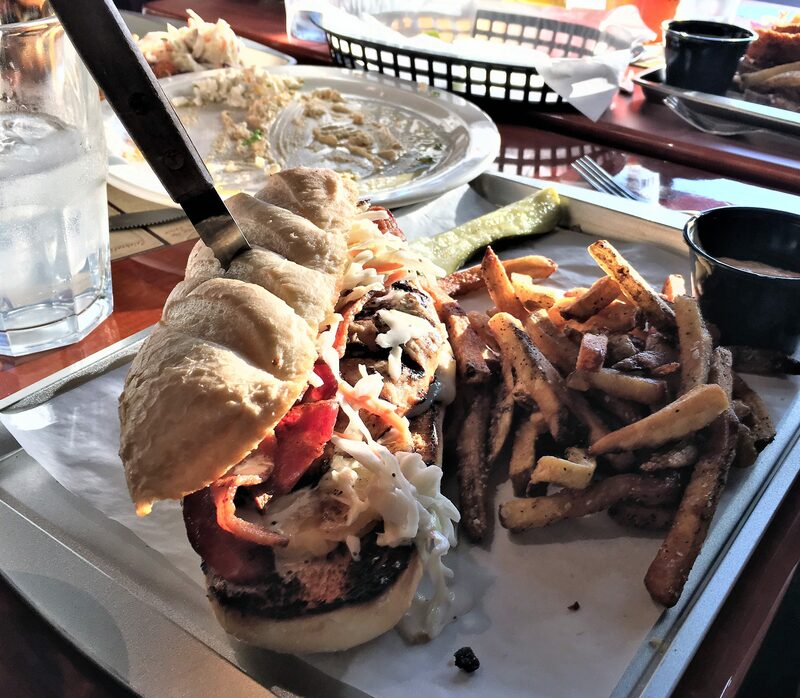 The food is also a plus at Flyboy. 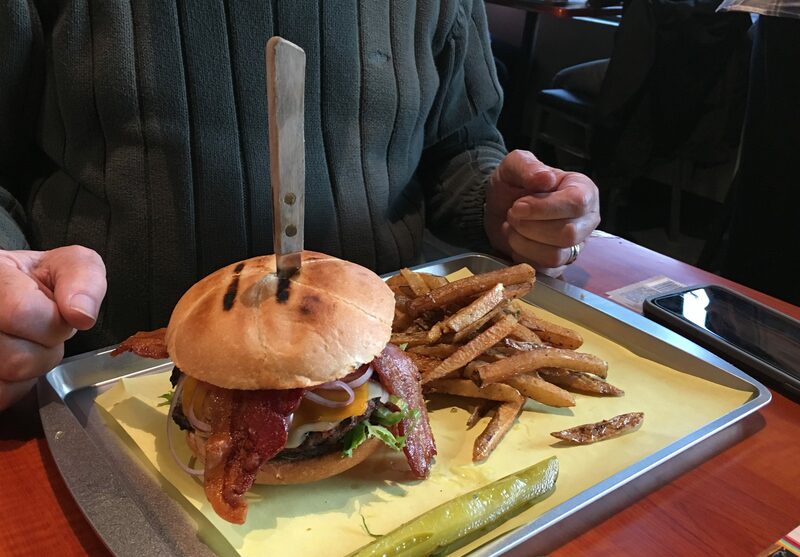 Great burgers, sandwiches, salads and pizza (rectangular! at $10-14). The prices are very reasonable. 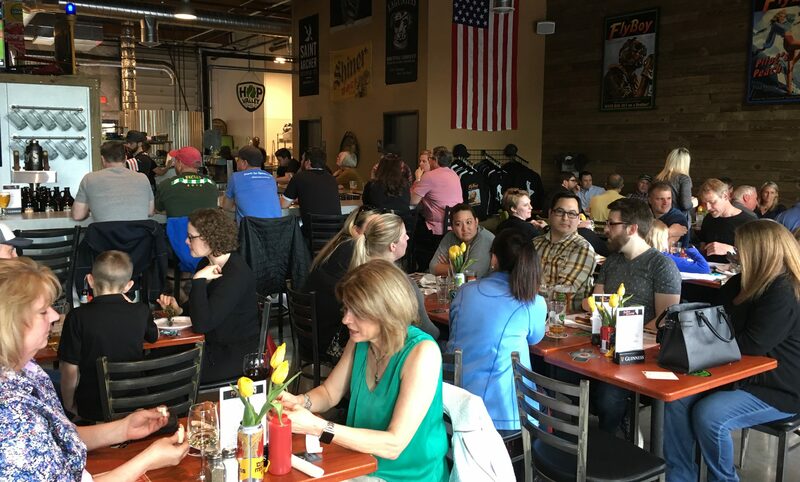 Becker franchised a Vancouver brewpub and the Tigard location has growth potential with 160 parking spaces available and ample brewing and kitchen capacity (he purchased his brewery equipment including nine fermenters and a seven barrel system from Brett Joyce, now President of Rogue Ales). He will start brewing 300-325 kegs per month with limited distribution and a patio in front of the restaurant will be ready this summer. We need places like this in SoCal! 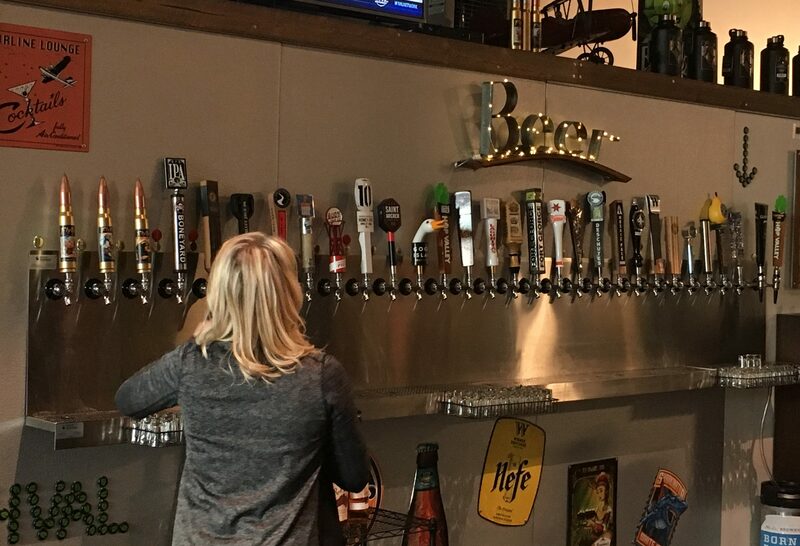 The beer is top shelf, the food is amazing made with fresh ingredients, and the staff is amazing…… Some of the friendliest people I’ve ever met. Michelle’s personality is infectious, the nicest most genuine person I’ve ever had the pleasure of meeting. My wife and I have been amazed with the enthusiastic crowds each time we have returned – and a lot of them appear to be regulars already. Mark’s story and perseverance is absolutely inspiring. 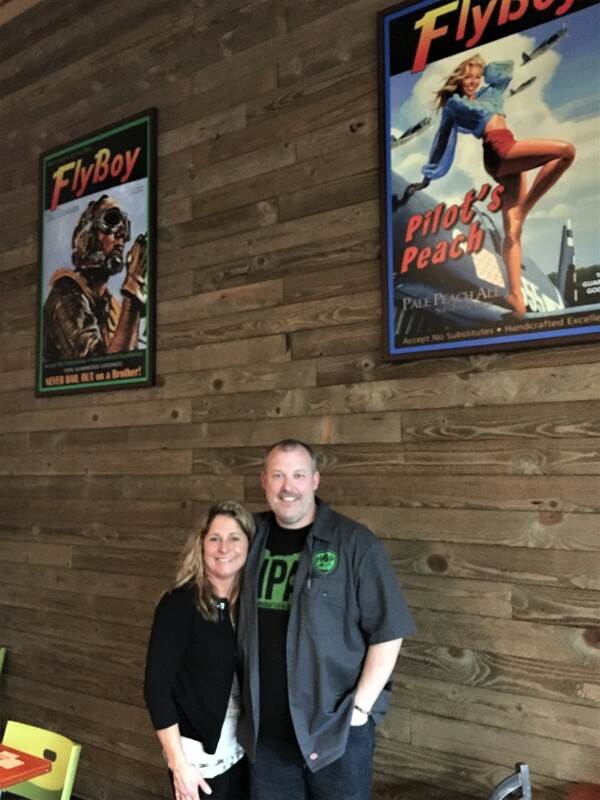 Navigate a flight path to Flyboy and say hello to Mark and Michelle – don’t worry, Michelle will beat you to the punch with the greeting!